This entry is filed under modern and tagged bunk, cabin, girl, high, kids, loft, modern, sleeper, storage, youth. We accept all ways of payments. We have a assembly service. DIMENSIONS OF SET: height: 180 cm [5.90 ft]. Width (bed with stairs): 245 cm [8.03 ft] depth: 125 cm [4.10 ft] DIMENSIONS OF LOFT BED: height: 180 cm [5.90 ft] width: 195 cm [6.39 ft] depth: 86 cm [2.82 ft] Small Single Size = 2′ ft 6″ Inches Wide X 6′ ft 3″ Inches long or 80 cm x 190 cm approx DIMENSIONS OF DESK: width: 100 cm [3.28 ft] depth: 52 cm [1.70 ft] DIMENSIONS OF WARDROBE: height: 143 cm [4.69 ft] width: 59 cm [1.96 ft] depth: 52 cm [1.70 ft]. DIMENSIONS OF BOOKCASE: height: 143 cm [4.69 ft] width: 30 cm [0.98 ft] depth: 52 cm [1.70 ft] DIMENSIONS OF STAIRS: width: 55 cm [1.80 ft] depth: 125 cm [4.10 ft] FRONTS OF THE SET (WARDROBE, DESK AND STAIRS) ARE AVAILABLE IN FOLLOWING COLOURS: – blue matte – sky blue matte – grey matte – lime (green) matte – pink matte – orange matte – turquoise matte – lemon (yellow) matte – white matte BODY OF THE BED: WHITE MATTE. The upper sleeping surface is protected with a safety barrier. Protects the baby from falling out. 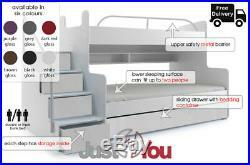 The bed is equipped with five steps. In steps are located practical storage (sliding drawers). The wardrobe of the set has two doors. In the interior of the wardrobe are located shelves. The stairs can located. On the left or right side of bed. Bed frame is made from plywood which is making frame very strong. Each frame has a 24 wooded slats. Can be used as a sleeping surface. Conditioning fibre, that provides adequate ventilation of the mattress. Soft on both sides. Of mattress 12 cm. Furniture in flat packs is specifically designed to be ease for self-assembly. The decorative elements used for the presentation of the product, do not form an integral part. Colours on the visualization may differ from reality. This is related to the personal setting of your monitor/mobile device. The entire bed is manufactured using eco-friendly materials and paints sale for health. YOU NEED AN ASSEMBLY SERVICE? WE HAVE AN ASSEMBLY SERVICE! Normally it takes quicker. Everything depends on the production itself and the components which have already been produced. We issue a VAT invoice for each product. For most orders, we do not take advance payments and a deposit. The deposit paid is not refundable after one week of placing the order. The condition of order realization is the customer providing data allowing verification of the customer and the recipient of the goods. The range of deliveries is divided into seven available zones marked with colours. Others postcodes are not supported by us. Due to many enquiries, FURNITURE JUST4U LIMITED recommends first telephone contact. The product may slightly differ from the one shown in the illustration. Type, size and individual screen settings can cause that the colour presented on the visualization will not be slightly different from reality. The customer has the right to cancel his order without giving a reason. If you cancel your order after receiving the goods, the customer is responsible for the storage and not using the furniture until the return. During the return, the customer is obliged to deliver the furniture to the company’s warehouse on their own and at their own expense. The furniture should be delivered to the company’s warehouse, which is given in the general information in point “1.6″. After delivering the furniture to the company’s warehouse, they will be checked by the company’s employee to check their condition and the number of items that should be in the manual. In case the delivered furniture will be in a damaged condition or missing any elements, the return of the furniture will not be accepted. FURNITURE JUST4U LIMITED reserves the right to cancel the order if the customer raises doubts or is suspected to work against the company. To reduce costs to a minimum, the complaint does not include replacement of the whole item. Replacement covers only the damaged or missing part. A detailed description of the damaged parts will allow us to speed up the time of the complaint. Furniture that does not fit in the entrance to the house or on the stairs because of the size (hard furniture is delivered in packs, upholstery in large dimensions) are not subject to complain or return. All information regarding the size of packages can be obtained in the customer service department. FURNITURE JUST4U LIMITED is not liable for damages resulting from the use of other transport or assembly companies than FURNITURE JUST4U LIMITED. Any damage caused during transport cannot be the subject of a complaint. The condition for accepting the complaint is sending the information we require as described in item “6.4″. If the client does not adjust to the point “6.4″, the complaint is not accepted. Items damaged by customer’s fault are not subject to complaint. We are not responsible for misinterpretations of reading assembly instructions. The customer is obliged to sign a copy of the VAT invoice and the acceptance protocol (if any) received. Drivers are required to bring furniture only through the doorstep threshold in the houses and on the ground floor of the staircase in the case of blocks. Bringing furniture to other places than described in point “4.4″ will be charged. The prices are individual depending on the floor and difficulties with bringing in. On England and Wales area. The item “MODERN CABIN LOFT BED HIGH SLEEPER BOY GIRL BUNK BED SET STORAGE KIDS YOUTH” is in sale since Friday, August 10, 2018. 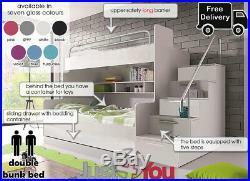 This item is in the category “Home, Furniture & DIY\Children’s Home & Furniture\Furniture\Beds with Mattresses”. 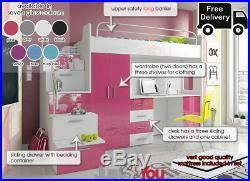 The seller is “furniture_just4you” and is located in Croydon. This item can be shipped to United Kingdom. This entry is filed under modern and tagged bedroom, bunk, double, girl, kids, mattresses, modern, storage, triple, youth. It will let us. We have a much more furniture offers. No need to pay in advance! Normally it takes quicker. Everything depends on the production itself and the components which have already been produced. YOU LIVE IN RED ZONE? COST OF GREY AREA – ARE QUOTED INDYWIDUALNY. NORTHERN IRELAND IS NOT AVAILABLE!!! We would like to remind everyone that cost of transport do NOT include bringing furniture into flat/house/apartment. That our deliveries are made by ONLY ONE person. Please make sure there is always someone to help as some of our packages can be heavy. The item “MODERN BEDROOM KIDS YOUTH DOUBLE TRIPLE BUNK BED STORAGE MATTRESSES BOY GIRL” is in sale since Wednesday, October 25, 2017. 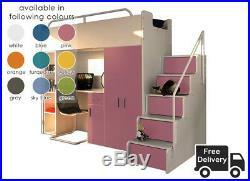 This item is in the category “Home, Furniture & DIY\Children’s Home & Furniture\Furniture\Beds with Mattresses”. The seller is “furniture_just4you” and is located in Croydon. This item can be shipped to United Kingdom. This entry is filed under modern and tagged bunk, double, drawer, girl, kids, mattresses, modern, storage, triple, youth. Double or triple modern. 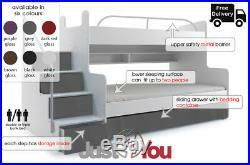 BUNK BED MAX 3 GLOSS. With foam mattresses and storage. DIMENSIONS OF BUNK BED: HEIGHT: 146 cm WIDTH (BED WITH STAIRS): 258 cm DEPTH: 125 cm UPPER SLEEPING SURFACE OF THE BED: 80 x 190 cm (2′ ft 6″ Inches Wide X 6′ ft 3″ Inches long or 76 cm X 190 cm approx) LOWER SLEEPING SURFACE OF THE BED: 120 x 190 cm (3′ ft Wide X 6′ ft 3 Inches Long or 90 cm X 190 cm approx) THE SET INCLUDES THE FOLLOWING ELEMENTS: – BODY OF BUNK BED – BEDDING CONTAINER – TWO BED FRAMES – STAIRS WITH BARRIER – UPPER SECIURITY BARRIER – OPTIONAL FOAM MATTRESSES T25. 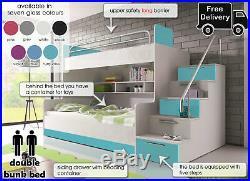 BED FRAME is made from plywood which is making frame very strong. TWO FOAM MATTRESSES T25 – DOUBLE SIDED. Both sides of mattress can be used as a sleeping surface. Conditioning fibre, that provides adequate ventilation of the mattress. Soft on both sides. 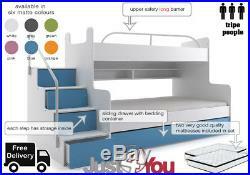 Height of mattress 12 cm. The guarantee covers the main input of the mattress. The foam should not crumble or break. Mattress is an object that is constantly working, so it is subject to use. The mattress needs to work m different places to keep its properties. Only then it will consume evenly, and on its surface there will be. This is because of improper use of the mattress and the changes made on its surface are not the result of a defect m the product, but the damage done by the user, which can be stated. A mattress is a everyday use item, which works every day. But this properly “serviced” will retain its properties longer and will provide you with a comfortable night’s sleep. Mattress unpacked from the foil is treated as. 609 YOU GET BUNK BED MAX 3 WITHOUT MATTRESSES. BUNK BED WITH MATTRESSES AVAILABLE IN FOLLOWING CONFIGURATION: WITH TWO FOAM MATTRESSES. The entire bed is manufactured using eco-friendly materials and paints sale for health! It will let us. We have a much more furniture offers. No need to pay in advance! Normally it takes quicker. Everything depends on the production itself and the components which have already been produced. YOU LIVE IN RED ZONE? COST OF GREY AREA – ARE QUOTED INDYWIDUALNY. NORTHERN IRELAND IS NOT AVAILABLE!!! We would like to remind everyone that cost of transport do NOT include bringing furniture into flat/house/apartment. That our deliveries are made by ONLY ONE person. Please make sure there is always someone to help as some of our packages can be heavy. The item “MODERN KIDS YOUTH DOUBLE OR TRIPLE BUNK BED STORAGE DRAWER MATTRESSES BOY GIRL” is in sale since Tuesday, March 20, 2018. This item is in the category “Home, Furniture & DIY\Children’s Home & Furniture\Furniture\Beds with Mattresses”. The seller is “furniture_just4you” and is located in Croydon. This item can be shipped to United Kingdom. We accept all ways of payments. We have a assembly service. DIMENSIONS OF SET: height: 180 cm [5.90 ft] width (bed with stairs): 254 cm [8.33 ft] depth: 120 cm [3.93 ft] DIMENSIONS OF LOFT BED: height: 180 cm [5.90 ft] width: 204 cm [6.69 ft] depth: 86 cm [2.82 ft] Small Single Size = 2′ ft 6″ Inches Wide X 6′ ft 3″ Inches long or 80 cm x 190 cm approx DIMENSIONS OF DESK: height: 75,5 cm [2.47 ft] width: 140 cm [4.59 ft] depth: 50 cm [1.64 ft] DIMENSIONS OF WARDROBE: height: 138 cm [4.52 ft] width: 60 cm [1.96 ft] depth: 50 cm [1.64 ft] DIMENSIONS OF STAIRS: width: 50 cm [1.64 ft] depth: 120 cm [3.93 ft] FRONTS OF THE WARDROBE, DESK AND STAIRS ARE AVAILABLE IN FOLLOWING COLOURS: – white gloss – black gloss / white gloss – grey gloss / white gloss – purple gloss / white gloss – pink gloss / white gloss – blue gloss / white gloss – turquise gloss / white gloss BODY OF THE BED: WHITE MATTE In the standard options the upper sleeping surface is protected with a long (185 cm) safety barrier. Barrier protects the baby from falling out. 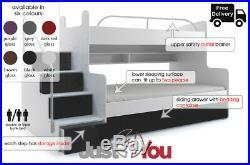 The bed is equipped with five steps. In steps are located practical storage (doors opening down). Fronts of set are made of laminated MDF boards in high gloss. Handles are made PCV material. Wardrobe has two doors and three shelves. 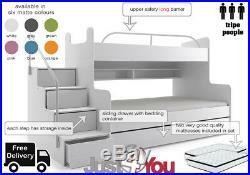 FOAM MATTRESS T25 – DOUBLE SIDED INCLUDED IN PRICE OF SET. Both sides of mattress can be used as a sleeping surface. Conditioning fibre, that provides adequate ventilation of the mattress. Soft on both sides. Height of mattress 12 cm. Furniture in flat packs is specifically designed to be ease for self-assembly. The decorative elements used for the presentation of the product, do not form an integral part. Colours on the visualisation may differ from reality. This is related to the personal setting of your monitor/mobile device. 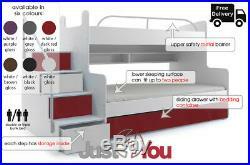 The entire bed is manufactured using eco-friendly materials and paints sale for health. YOU NEED AN ASSEMBLY SERVICE? WE HAVE AN ASSEMBLY SERVICE! Normally it takes quicker. Everything depends on the production itself and the components which have already been produced. We issue a VAT invoice for each product. For most orders, we do not take advance payments and a deposit. The deposit paid is not refundable after one week of placing the order. The condition of order realization is the customer providing data allowing verification of the customer and the recipient of the goods. The range of deliveries is divided into seven available zones marked with colours. Others postcodes are not supported by us. Due to many enquiries, FURNITURE JUST4U LIMITED recommends first telephone contact. The product may slightly differ from the one shown in the illustration. Type, size and individual screen settings can cause that the colour presented on the visualization will not be slightly different from reality. The customer has the right to cancel his order without giving a reason. If you cancel your order after receiving the goods, the customer is responsible for the storage and not using the furniture until the return. During the return, the customer is obliged to deliver the furniture to the company’s warehouse on their own and at their own expense. The furniture should be delivered to the company’s warehouse, which is given in the general information in point “1.6″. After delivering the furniture to the company’s warehouse, they will be checked by the company’s employee to check their condition and the number of items that should be in the manual. In case the delivered furniture will be in a damaged condition or missing any elements, the return of the furniture will not be accepted. FURNITURE JUST4U LIMITED reserves the right to cancel the order if the customer raises doubts or is suspected to work against the company. To reduce costs to a minimum, the complaint does not include replacement of the whole item. Replacement covers only the damaged or missing part. A detailed description of the damaged parts will allow us to speed up the time of the complaint. Furniture that does not fit in the entrance to the house or on the stairs because of the size (hard furniture is delivered in packs, upholstery in large dimensions) are not subject to complain or return. All information regarding the size of packages can be obtained in the customer service department. FURNITURE JUST4U LIMITED is not liable for damages resulting from the use of other transport or assembly companies than FURNITURE JUST4U LIMITED. Any damage caused during transport cannot be the subject of a complaint. The condition for accepting the complaint is sending the information we require as described in item “6.4″. If the client does not adjust to the point “6.4″, the complaint is not accepted. Items damaged by customer’s fault are not subject to complaint. We are not responsible for misinterpretations of reading assembly instructions. The customer is obliged to sign a copy of the VAT invoice and the acceptance protocol (if any) received. Drivers are required to bring furniture only through the doorstep threshold in the houses and on the ground floor of the staircase in the case of blocks. Bringing furniture to other places than described in point “4.4″ will be charged. The prices are individual depending on the floor and difficulties with bringing in. On England and Wales area. The item “MODERN CABIN LOFT BED HIGH SLEEPER BOY GIRL BUNK BED SET STORAGE KIDS YOUTH” is in sale since Monday, October 23, 2017. This item is in the category “Home, Furniture & DIY\Children’s Home & Furniture\Furniture\Beds with Mattresses”. The seller is “furniture_just4you” and is located in Croydon. This item can be shipped to United Kingdom. Double or triple modern BUNK BED MAX 3. With foam mattresses and storage. 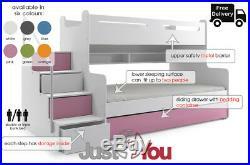 DIMENSIONS OF BUNK BED: HEIGHT: 146 cm WIDTH (BED WITH STAIRS): 258 cm DEPTH: 125 cm UPPER SLEEPING SURFACE OF THE BED: 80 x 190 cm (2′ ft 6″ Inches Wide X 6′ ft 3″ Inches long or 76cm X 190cm approx) LOWER SLEEPING SURFACE OF THE BED: 120 x 190 cm (3′ ft Wide X 6′ ft 3 Inches Long or 90 cm X 190 cm approx) THE SET INCLUDES THE FOLLOWING ELEMENTS: – BODY OF BUNK BED – BEDDING CONTAINER – TWO BED FRAMES – STAIRS WITH BARRIER – UPPER SECIURITY BARRIER – OPTIONAL FOAM MATTRESSES T25. BED FRAME is made from plywood which is making frame very strong. SET IS AVAILABLE WITHOUT MATTRESSES OR. WITH MATTRESSES IN FOLLOWING CONFIGURATIONS: TWO FOAM MATTRESSES T25 – DOUBLE SIDED. Both sides of mattress can be used as a sleeping surface. Conditioning fibre, that provides adequate ventilation of the mattress. Soft on both sides. Height of mattress 12 cm. The guarantee covers the main input of the mattress. The foam should not crumble or break. Mattress is an object that is constantly working, so it is subject to use. The mattress needs to work m different places to keep its properties. Only then it will consume evenly, and on its surface there will be no recesses. This is because of improper use of the mattress and the changes made on its surface are not the result of a defect m the product, but the damage done by the user, which can be stated. A mattress is a everyday use item, which works every day. But this properly “serviced” will retain its properties longer and will provide you with a comfortable night’s sleep. Mattress unpacked from the foil is treated as used and non-refundable. The entire bed is manufactured using eco-friendly materials and paints sale for health! 609 YOU GET BUNK BED MAX 3 WITHOUT MATTRESSES. BUNK BED WITH MATTRESSES AVAILABLE IN FOLLOWING CONFIGURATION: WITH TWO FOAM MATTRESSES. It will let us. We have a much more furniture offers. No need to pay in advance! Normally it takes quicker. Everything depends on the production itself and the components which have already been produced. YOU LIVE IN RED ZONE? COST OF GREY AREA – ARE QUOTED INDYWIDUALNY. NORTHERN IRELAND IS NOT AVAILABLE!!! We would like to remind everyone that cost of transport do NOT include bringing furniture into flat/house/apartment. That our deliveries are made by ONLY ONE person. Please make sure there is always someone to help as some of our packages can be heavy. The item “MODERN BEDROOM KIDS YOUTH BOY OR GIRL DOUBLE TRIPLE BUNK BED STORAGE MATTRESSES” is in sale since Monday, November 13, 2017. 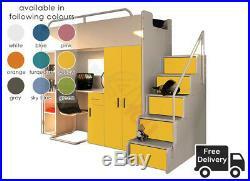 This item is in the category “Home, Furniture & DIY\Children’s Home & Furniture\Furniture\Beds with Mattresses”. The seller is “furniture_just4you” and is located in Croydon. This item can be shipped to United Kingdom.